The Vertiflo 1400 Horizontal End Suction Pump is designed for process, pollution control, spray systems, deionized water, wastewater, corrosive liquids and chemicals. The heavy duty cast iron frame design incorporates integrally cast support and ribbed mounting feet, which assure a solid, dependable pump installation and operation. One frame fits all pump sizes. The frame has a back pull-out design feature, which allows for easy inspection or maintenance without disturbing the piping to the pump. Wiping vanes reduce axial loading and prevent dirt from entering the sealing area. Packing or various mechanical seal arrangements are available as standard options. 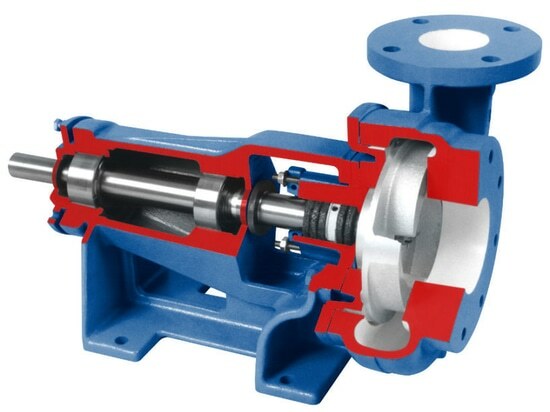 The pump is offered in a variety of materials: cast iron, 316 stainless steel fitted, all 316 stainless steel, or CD4MCu.